Lo Wang goes hard and violent in the Shadow Warrior 2 demo from QuakeCon 2016. “Subtle” isn’t exactly a word associated with Flying Wild Hog’s Shadow Warrior. A reboot of 3D Realms’s classic shooter published under Devolver Digital, 2013’s Shadow Warrior follows the vengeance tale of Lo Wang, a “corporate shogun” ordered to retrieve a legendary katana connected to ancient gods from another realm. Left for dead by his employers, Lo Wang sets out to end a demonic invasion and take revenge upon Zilla Enterprise and the merciless Orochi-Zilla. The reboot expanded upon the 1997 shooter with a robust catalog of weapons, vulgar offbeat humor and optional precision-based swordplay. Shadow Warrior 2 resumes five years later with the world now torn between dimensions, creating a savage coexistence of humans and demons. 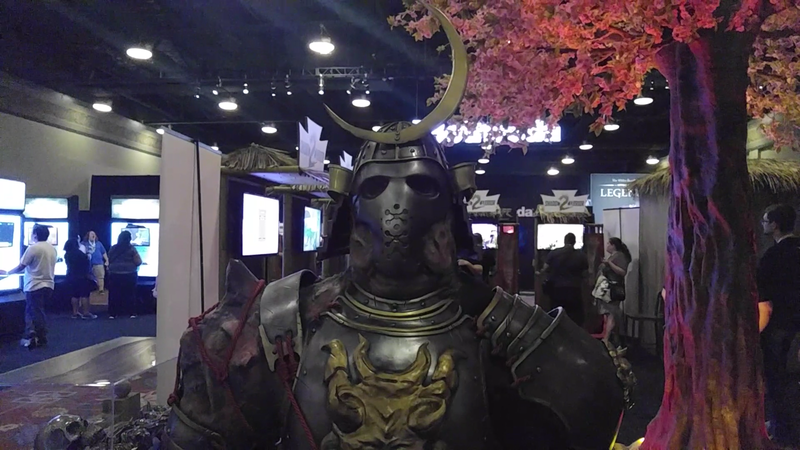 Scheduled to arrive later this year, Devolver Digital brought a playable build of Shadow Warrior 2 to QuakeCon 2016 en masse; the game was featured not just at the Devolver booth, but also the Alienware and NVidia areas of the exhibitor floor. I spent quite a bit of time playing through the new build, as Shadow Warrior 2 features procedural environments and enemies as a gameplay tie-in to the story. The demo begins with the story already in motion, as Lo Wang and his new supernatural partner- a spirit that shares his body and grants him magical abilities- are tasked with obtaining a series of shards and artifacts. After a brief introduction to Wang’s reluctant spiritual companion, the demo warped me into an Eastern-inspired oriental garden area rife with demons. This was the first of many seamlessly connected environments, followed by several overgrown cave systems and a misplaced winter area…because “inter-dimensional shifts”. Just moments into my Shadow Warrior 2 expedition, it was clear how much the visual quality of the series has improved in 3 years- Shadow Warrior 2 is absolutely gorgeous. The title has enough color to push the game into whimsical story book Fantasy territory, despite being a crass ultra-violent hybrid of a hack-and-slash and shooter. Only a handful of melee weapons were present in the QuakeCon demo, however the selected arsenal of blades masterfully showcased Shadow Warrior 2‘s improved precision damage technology. Metal Gear Rising may have beaten Shadow Warrior to the tagline “Cut at will“, however bladed strikes leave directional lacerations; the best example was found in the chainsaw, as I could manually dismember demons into all sorts of nonsensical shapes. As the enemies and locations are procedurally generated, Shadow Warrior 2 never fails to throw a wide variety of demons at the player. I often found myself simultaneously fighting against towering brutes, sinewy demons carrying hazardous elemental barrels, and “Fangs” that could reel me in close for a vicious bite. On two occasions, the demo pit me up against progression-blocking mini-bosses- titanic shoguns corrupted by dark magic. What were by far the most difficult challenges of the QuakeCon build, these monstrous warriors were some of the most mobile of the present enemies; both fights escalated into a magic-throwing battle between tiers, with both me and the mid-boss frantically hopping back and forth between cliffs and valleys. The final release will also support 4-player co-op, however despite the intimidating presence of the game at QuakeCon 2016, co-op was not present at any of the demo stations. With its drastically improved visuals, expanded mechanics and zero-restraints adult humor, Shadow Warrior 2 looks to be a fantastic progression of the rebooted series. Shadow Warrior 2 will release for PC, Xbox One and PS4 later this year, though an official release date has not been announced.